The Benrath Palace was erected in 1755 by Nicolás Pigage. The Elector Palantine Charl Theodor and his wife decided to built it in the XVIII century. However, the prince spent only one night in it. The rosy tone of the facade has a simple meaning: formerly pink color was associated to men meanwhile blue color was associated to women. The most impressive part of the palace is its outside. Surrounded by gardens, which come to an end in the bank of the Rhein, the palace welcome not only foreign visitors but also everybody who wants to enjoy a peaceful open space. Furthermore, it is possible to find a huge variety of trees and fountains, all of this created created for royals´ shootings. Visitors can easily transport themselves to the XVIII century during his tour around this huge open space. 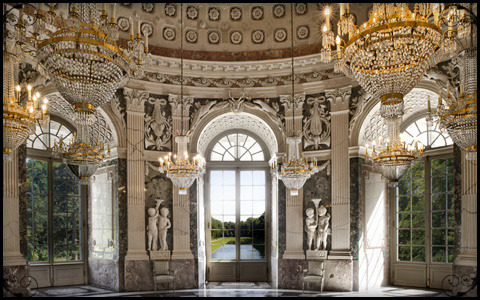 Inside the Baroque maison the visitors can find the Museum for European Garden Art and the Museum of Natural History. As well as different halls where the visitor can figure out the life-style of the royalty. The ticket costs 14€ and the museums are open from Tuesday until Friday from 11.00 to 17.00h. One of the annexed building was reconverted in a cute cafeteria where people can find a wide variety of cakes (including the famous Sacher Torte of Vienna). So my recommendation for your next holidays is to come and enjoy this charming place, to have a walk around its gardens and to have a tasty afternoon snack in its cafeteria.